Read the 2016 Cardiology brochure. The Cardiology service provides specialized diagnosis and care of small and large animal patients with structural and/or electrical cardiac dysfunction. The service provides diagnosis, long-term and emergency medical management of cardiac diseases and arrhythmias in all animal species, as well as interventional therapy for congenital cardiac diseases and pacemaker implantation. Comprehensive, compassionate patient and client care are the primary goals of the Cardiology Service. Watch this Fox 5 Atlanta video about Mason, who had successful Balloon Valvuloplasty. The Cardiology Service evaluates all species of animals including, but not limited to, dogs, cats, horses, farm animals, and exotic animals for a variety of cardiac conditions. Some of the most common cardiac diseases diagnosed and managed by the cardiology service include: patent ductus arteriosus (PDA), pulmonic stenosis (PS), degenerative valve disease, dilated cardiomyopathy, and hypertrophic cardiomyopathy. The Cardiology Service also manages congestive heart failure and arrhythmias, which can occur as a result of many systemic or cardiac diseases. The cardiologists work closely with other specialty services in the hospital in order to ensure the cardiovascular health and stability of all patients prior to sedation, surgical procedures, and/or treatment with chemotherapeutic agents. This close collaboration also allows identification of cardiac disease of patients with co-morbid conditions, in which prognosis may be changed by the presence of the cardiovascular disease. The Cardiology Service also provides cardiac screening for dogs and cats at risk for certain cardiac conditions. The Cardiology Service has the benefit of access to state-of-the-art equipment for diagnosis and treatment of heart disease. This includes digital radiography, echocardiography (transthoracic and transesophageal), electrocardiography (ECG), Doppler blood pressure, digital Holter monitoring equipment (24 hour ECG monitoring), and a fully equipped catheterization laboratory with fluoroscopy. The catheterization laboratory is used for minimally invasive trans-catheter procedures such as: PDA occlusion, balloon valvuloplasty for PS, placement of transvenous pacemakers, and diagnostic angiography. 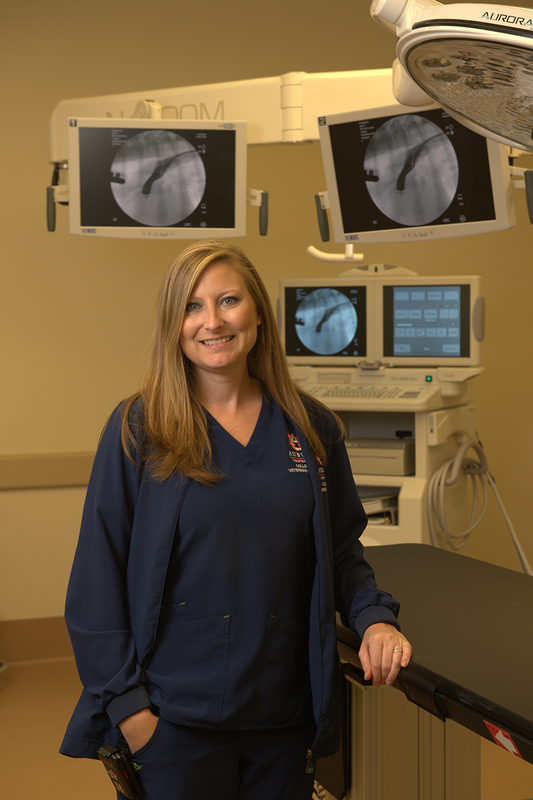 The Cardiology Service is composed of two faculty who are board certified by the American College of Veterinary Medicine (ACVIM) (Cardiology) who work exclusively on the clinical service. Additionally, the service has one board certified cardiologist working concurrently as a PhD candidate and one veterinarian (specialty intern) who is undergoing training to become a specialist. The service has three veterinary technician nurses who assist the veterinarians and senior level veterinary students with management of the service. 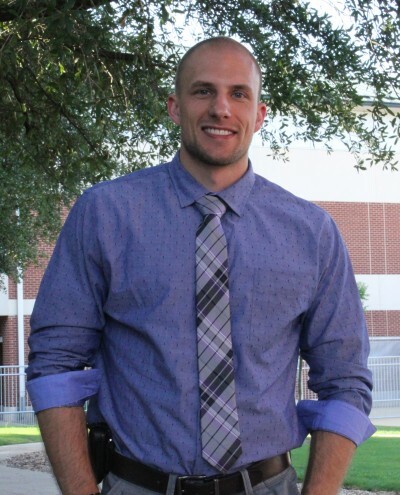 Dr. Newhard received his DVM from the University of Florida in 2014. After graduation, he completed a companion animal medicine and surgery rotating internship at Louisiana State University. He then came to Auburn to complete a cardiology internship. 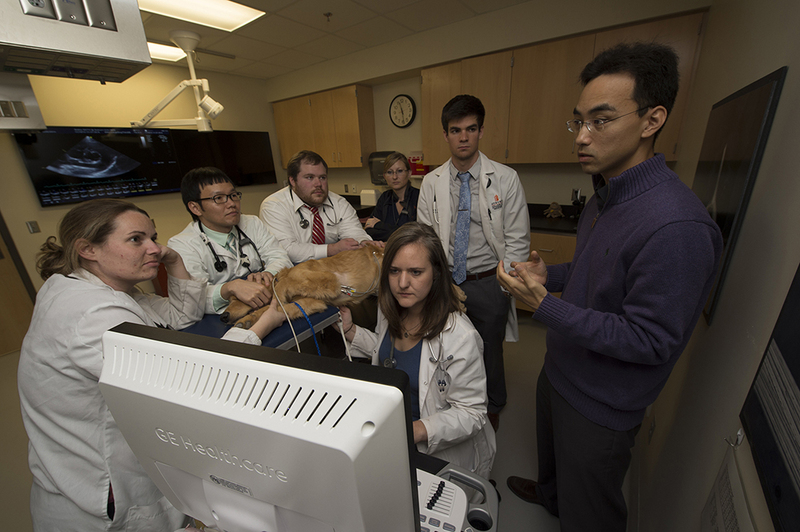 His special disciplinary interest is in cardiology and will serve as Auburn University College of Veterinary Medicine’s first cardiology resident.